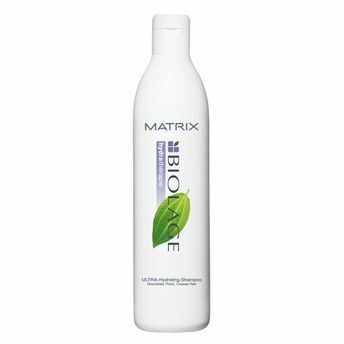 Matrix biolage ultra hydrate shampoo draws inspiration from the rain forest?s ever replenishing moisture cycle. Biolage's new technology hydra th?rapie continuously nourishes hair and prevents the dehydration cycle with the anti dry care of aloe and passion fruit. It is a hydrating shampoo with the goodness of algae extracts, conditioning balm cera repair treatment help nourish hair for extreme softness, shine and manageability. Biolage has created hydrating th?rapie professional low pH formulas with orchid and UV Complex to moisturize and protect the depth, tone and shine of colour or chemically treated hair without parabens or synthetic dyes. Additional Information: With regular usage of the hydrating shampoo plus conditioner, hair become softer,smoother and shinier. Alternatively, you can also find many more products from the Matrix Biolage Ultra Hydrating Shampoo range.